Join VeggieTales creator Phil Vischer and his new friends on the second installment of their journey through the world’s most amazing book – the Bible! Part 2: “What is salvation?” Learn words like “salvation” and “redemption” as we dive into God’s big rescue plan – how He saved the Israelites from Egypt and how he wants to save us from sin – a tiny word that causes huge trouble. We don't have a video clip of "Let My People Go" yet, but you can view a sample of the Theme Song for the series by watching this video clip. 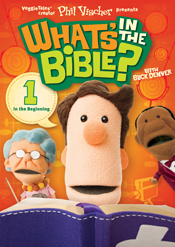 The first DVD introduces kids to the Bible and the book of beginnings, Genesis. Kids will learn about the key people in Genesis and the important lessons their stories teach us. Approximately 56 minutes. 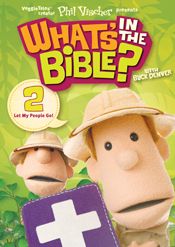 In What’s In the Bible #3, Wanderin’ in the Desert, Buck Denver and his cast of friends take us through the next three books of the Bible—Leviticus, Numbers, and Deuteronomy—helping kids understand how these books fit in with Genesis and Exodus to make up the Pentateuch and to set the stage for the trials and victories of God’s people. In What's In the Bible #4, Battle for the Promised Land, Buck Denver and cast take the viewer through Joshua, Judges, and Ruth. They also explore two more Big Questions.